Although considered as a professional theologian, he considers himself as of “the people”, having been born and raised in Peru. After a first-rate theological education in Europe, he returned to minister to working-class people in Lima and found that he had to start leaning all over again, in the midst of his involvement with the people in Rimac, a slum area in Lima in which he still lives and works. It has only been a few years ago when Evangelical Christians have recovered its sense of solidarity with the poor. However, there is still much to be learned from the Evangelical wing of Christianity as it is also recently that Evangelical theologians have only started to peruse the challenge of going beyond sentimental acts of charity to that of engaging Scripture from a transformational perspective that is to bear witness to the Gospel in holistic terms rather than emphasizing only on its spiritual aspect. Like, Charles Ringma, I think there is much to be learned by engaging the writings of people that has been collectively referred to as Liberation Theologians by identifying how we can learn from their synthesis of Scripture, social theory and contextualized ministry to those who are living under the poverty line of Latin America as the church’s ministry to the underprivileged should not be merely presented within the periphery of the biblical story but rather it should be at the center and at the very heart of God’s love for the vulnerable and God’s passion for justice and shalom. In reflecting on this I believe Liberation Theology as according to Gustavo Gutierrez’s We Drink from Our Own Wells: The Spiritual Journey of a People challenges us to make God’s love for the poor central to our work of proclaiming redemptive wholeness but also to address our lack of an articulated spirituality which in a way reflects how we Evangelicals have been captive to pragmatics instead of placing ourselves more fully in the rich Christian tradition of spiritual disciplines, to which the book seeks to recover and integrate as a spirituality that animates the theology of the people’s struggle for God’s liberating work in the oppressed in history thus explaining Gutierrez’s theology of Christian poverty as an act of loving solidarity with the poor as well as a liberatory protest against poverty. According to Henri Nouwen’s introduction to the book, in A Theology of Liberation, Gutierrez was already speaking of the need for and the importance of a spirituality of liberation, as he has realized that a theology that does not come out of an authentic encounter with God can never be fruitful. As Gutierrez’s purpose for writing this work is twofold. First, it is a defense of his principals of Liberation Theology. Critics claimed Gutierrez’ writings were Communism with a Christian slant. Gutierrez never refuted the charge of having Communistic leanings which would have taken away from what he was trying to accomplish. Instead he kept defending the rights of the poor and the call of Christ to serve the most vulnerable and stayed away from a debate which would have just been political. 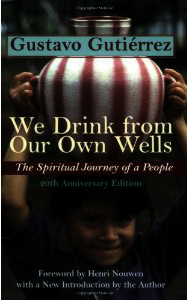 We Drink From Our Own Wells presents a spiritual basis for Liberation Theology demonstrating that his beliefs are not based on anything other than the message of Jesus Christ. A Christian is defined as a follower of Jesus, and reflection on the experience of following constitutes the central theme of any solid theology. The experience and the reflection alike have for their subject a community that under the movement of the Spirit focuses its life on the proclamation of the good news: the Lord is risen! Death and injustice are not the final word of history. Christianity is a message of life, a message based on the gratuitous love of the Father for us. For me the central idea of the book can be found in the Christological basis of Christian discipleship that springs forth in a theology that recovers the identity of Christ as one who reaches his hand to offer salvation to those living in the margins: the poor, the dispossessed, the lepers, the widows, the orphans and the sinners. To profess “this Jesus,” to acknowledge “Jesus the Christ,” is to express a conviction. It is not simply putting a name and a title together; it is an authentic confession of faith. It is the assertion of an identity: that Jesus of history, the son of Mary, the carpenter of Nazareth, the preacher of Galilee, the crucified, is the Only Begotten of God, the Christ, the Son of God. Jesus’ concrete form of proclaiming the gratuitous love of God and kingdom had inevitable consequences for the religious, social and economic order prevailing at his time. “They watched him” and planned his execution (Mark 3:1-6)…precisely because it was a religious teaching that affected all human existence. To the question “Who do you say I Am?” we cannot give a merely theoretical or theological answer. What answers it, in the final analysis, is our life, our personal history, our manner of living the gospel. Peter’s affirmation, “You are the Christ,” is fundamental. But what is demanded is that we make that affirmation the guiding thought of our life –accepting all the consequences, as dire they may be. Only so is our response valid, as honest and sincere it may be without it. Our response to the question, “Who do you say I Am?” does not end with a profession of faith or a theological systemization. It is a question addressed to our life and that of the entire church. It permanently tests the Christian faith, leading it to its ultimate consequences. As disciples of this Christ we are also called to do likewise in a way that we would incarnate Christ’s presence among the poor by following Christ in discipleship which includes the path of self-giving love and loving identification with the outcasts, the redemptive vision to give life in its fullness and the conviction to live in loving identification that goes even unto suffering and death. To walk according to the Spirit is to reject death (selfishness, contempt for others, covetousness, idolatry) and choose life (love, peace, justice). To renounce the flesh and live according to the Spirit is to be at the service of God and others. This service is offered with the conviction that the forces of death will not have the final word in history, because we know that “in all these things we are more than conquerors through him who loved us” (Rom. 8:37). Nothing, and no one, “will be able to separate us from the love of God in Christ Jesus our Lord (v.38). Spirituality is a community enterprise. It is a passage of a people through the solitude and dangers of the dessert, as it carves its own way in the following of Jesus Christ. This spiritual experience is the well from which we must drink. From it we draw the promise of resurrection. Coming from an activist background I find the book insightful in the sense that it shows that spirituality has its place even among those who are engaged in the work of transformation in aspects of society and history. Gutierrez’s European education clearly shows with the type of language and wordplay that he uses in his writing. I find his style engaging although at times he tends to over repeat himself on some areas, but his emphasis on textual criticism of the Greek words that forms the Bible passages that he used are indispensable. It is relevant in the Filipino context as our identity as a people is very much related to that of those living in Latin America where we share a heritage of being a former colony of the Spanish Empire and not to mention that we both have a background of this ever-expanding gap between the rich and the poor and this struggle for the Christian church to offer an alternative vision of reality of God’s Kingdom in the midst of other existing alternatives like Marxism, totalitarianism and others. It also finds its relevance as very much like the Philippines countries in Latin America counts itself within the grouping of what has been called the Global South –former colonies that are faced with the challenges of nation and institution-building on their own for the first time. Perhaps the reading the book could be seen as an act of our solidarity with the plight of the Latin American people. I am not a Roman Catholic, and although I have a positive attitude towards Roman Catholicism (to the point that I have even seriously considered leaving my Evangelical tradition for Roman Catholicism!) I have such reservations on its submission to the ecclesial authority of Rome rather than that of the Scripture, that is however also counter-balanced by Gutierrez’s fidelity to biblical hermeneutics. Another is that in spite of my stance that there is much for us evangelicals to learn from liberation theologians –liberation theology itself (or better yet liberation theologies for there is no homogeneous expression of such) also need to be assessed although this book review is not intended to function as such. This entry was posted in Reviews, Spiritual Formation and tagged Gustavo Gutierrez, Latin Amerian Theology, Liberation Theology, orthopraxy, Spirituality by Chuck Baclagon. Bookmark the permalink.